Desert Pools resort, Desert Hot Springs. According to the weather guessers we gonna have some brutal weather. But so far not much more than some morning rain showers and very cloudy skies for most of the day. The problem here in this area is they have no storm sewer systems. Because they very seldom get any rain. So when it rains, the sun baked soil causes water to flow where ever it wants. And guess what ? It causes flooding, mud slides, road closures etc... They deal with it and then everything is good until the next time, maybe a year or two down the road. We just puttered around inside and got some (spring ?) cleaning done, Washed and waxed most of our wood work for a few hours. Was a job that needed to be done and perfect weather for it. Most of the day had rainy drizzle then we thought about heading outside to read around 3 pm as the sun came out. We had a surprise! Friends from Ontario Emile and Monique stopped by for a visit. They had just pulled in and set up this afternoon and looked us up. (they follow our blog). We chatted, shared stories and got caught up, a very nice social hour. The Palm Springs mountains did not appear from the cloud cover all day. We are still having more weather. Shortly after 4:30 pm the drizzle began again so they headed back home and we headed inside to whip up our dinner. Tonight a very tasty Italian Fettuccine Shrimp and a tossed salad, sure hit the spot. (not a great day for our Weber Q) for the recipe click the link HERE or check my recipe blog on the sidebar at the top left side. So easy to do. That was our fun day here in the storm zone, not too bad and we have full hookups. All is good with us. Thanks for the visit and hope your had an AWESOME day too. Relocating, to Desert Hot Springs CA, no rain and warmer temps... love it, oh yeah met more Canadians from Ontario too! Last night the weather guessers got it right. It rained, and it rained all night, and poured this morning until shortly after 9 am. We were still in Cherry Valley Resort, Beaumont CA. and relocating back to Desert Hot Springs this morning. The rain let up so we took the opportunity to secure our coach and hit the road before 10 am. By this time the highway was pretty well dry and we had a very strong tail wind and mostly down hill to Desert Hot Springs only 36 miles away. Seems like we used no fuel at all. Shortly after 11 am all checked in and set up on the same site we left a week ago. Much warmer here, and sunny. Big bonus "NO ROAD NOISE" yeah! Now set up here, no rain yet, maybe tonight and tomorrow but the winds and dust in the distance. According to a weather channel gusts up to 65 mph (105 kph). We are pretty sheltered here. Sure glad we decided not to boondock in the desert this weekend. Think we can afford $9.00 a night with full hookups. Got to enjoy a nice afternoon outside with our books for a while. Then 4 pm Jim and Judi (our new friends from Ontario) invited us to join them for a Happy Hour with Ron? and Alea from Ontario (near Peterborough). Such a small world that we travel in. Had a great time enjoying conversation and exchanging stories with these great people. Then hour is done time for dinner. Easy tonight, I had made a shepherd's pie the other day, just need to warm up in the oven (coulda done on the Weber Q but was such a windy day). Whipped up a nice tossed salad, and sure hit the spot. Lets see how the weather guessers do tonight? We don't care much, full hookups and here for 4 nights. No plans and just taking it easy. Thanks for stopping in again hope y'all had a great day too! Our plans are written in chalk, so we erased the board and made some changes..
Cherry Valley Lakes, Beaumont CA. We had a plan to leave here tomorrow morning and head to Borrego Springs California. Boon dock there for two nights then head over to Holtville "Hot Springs" BLM and boon dock there for two nights. BUT the weather forecast is telling us, 70- 100 percent rain for those areas. First rain we have seen since the ice storm back in Texas Dec 3rd 2013. Not really great camping in the desert with no sunshine and rain. So we did a quick check and found we could get back into Desert Pools Resort (Desert Hot Springs California) for the 4 nights in question ($9:00 a night with full hookups), so we grabbed that. So nice to be flexible. Today it was cool again but we had chores to do. Few groceries, laundry, dust vacuum, dump our sewage, check tires, etc.. and of course enjoy our books. We have been here for a week only $10.00 a night and a very nice resort BUT, the road noise from I-10 is not really fun, so we moving away and probably never come back, been there, done that! We did get to relax outside for a bit and enjoy out books but kinda chilly. No problem soon time for dinner anyway. Fire up our Weber Q 100 grill our last two garlic, farmers sausage from Ontario, potato slices and zucchini slices. Added to that some steamed broccoli, a fresh bun and we had a very tasty supper. Thats it for now, we are now in the process of heading back east to Ontario only 48 days to get there and its a long drive, places to see along the way and hopefully warm weather too. more plans written in chalk. Thanks for stopping on by for a peak glad to have you here. Hey we did it again, not much other than enjoy this great weather. Nice walkabouts the resort. Gotta get some exercise ya know! Once again we have no plan just hang out here, until thursday, relax and enjoy the California sunshine. They actually have more storage sites here than campsites.Truly amazing because as nice as the campground is. It is right next to I-10, like 100 yards from our coach! Six lanes of traffic travelling at 70 MPH. (112 KPH) lotsa road noise. I took a short drive to Banning CA, to top up our Verizon card at the Dollar General a few food stuffs and we good to go, internet for another month. After a bite for lunch and puttering about for a while, then down to the pool and hot tub for a soak. Love it when nobody is here. Now we can enjoy our books in the shade for a while. Soon time to fire up our Weber Q 100 to grill a couple homemade bacon cheese burgers and some homemade fries in our Fry Daddy. We are enjoying our time here. As far west as we are going to go this winter . Thursday we begin our slow trek back east. Thanks for enjoying the day with us, hope ya'll come back again! Plan A ended up with plan B think we stay right here. Cherry Valley resort Beaumont CA. Today we had a plan. At least we thought we had a plan. We wanted to take a drive to Long Beach California and tour the Queen Mary. A bit more research and told us a 90 minute drive. Pay for parking and $25:00 each to do a self guided tour of the ship. Not really in our budget so we canned that idea and decided to just enjoy the great weather we have here. Walkabouts the resort, puttering around and we had another great day. It is a very nice resort lots to see and do, except for the road noise right beside I-10, probabaly not come back here again as nice as it is. We did enjoy some more reading in the shade. new book for Suzie today, below. Then I gonna whip up dinner tonight. Hot pork sandwich (w/gravy), creamy whipped potatoes, and some steamed broccoli sure hit the spot. That was our fun day here in California, hope you had a great one too! A day trip to Oak Glen California, up in the mountains. As the usual we are up early, watched Canada win the gold metal in hockey as we expected, and it was an amazing game!! Then shortly after 8 am whipped over to the clubhouse for a fresh baked cinnamon roll and orange juice only a buck, good deal! 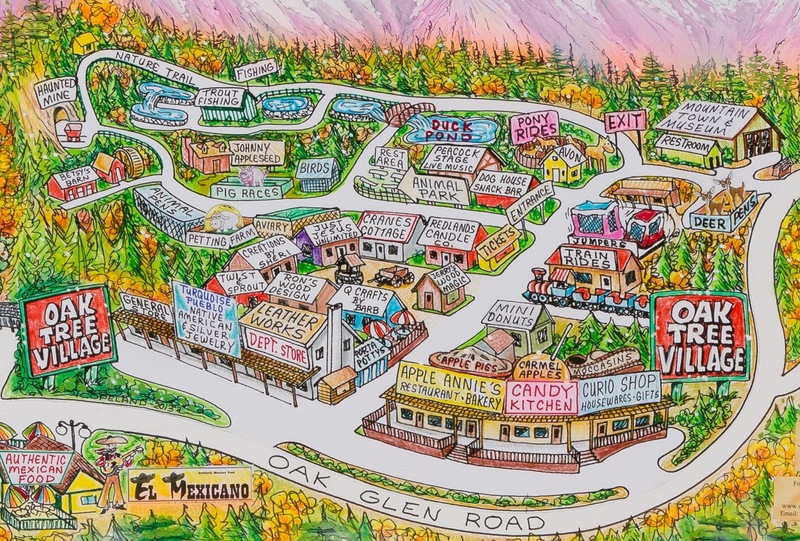 Then we went for a nice short country drive to Oak Glen California and wandered about Oak Tree Village. Maybe too early when we got there at 10 am. It was pretty quite. But it was a scenic drive up to an elevation of 5,200 feet. We did a nice walkabout and enjoyed this tourist area, glad there was no crowds this early in the morning . We were kinda disappointed with the village but still have nice scenic drive into the ,mountains here. Guess we were off season. Soon back home we had tooo much fun. A bite for lunch and enjoy our books in the shade. Picked up a nice pork shoulder picnic roast for .99 cents lb so gonna slow cook and smoke it on our Weber Q. Trivet, apple wood chips, low and slow, 4 hours and it was done to perfection! The sweet potatoes done on our Q too. Sweet Potatoes and Apples on the grill click HERE or check my recipe blog, Last couple minutes grilled the fresh asparagus and we had a feast! Did we do much today? As much as we wanted, and enjoyed every minute of it. Hope you did the same thing too. Cherry Valley Lake resorts, Beaumont Ca. Yep we did it again , enjoying this great weather and no plans for the day. I whipped over to Beaumont a few miles away picked up a few food items, cheap wine at Wally world, new shoes for me, ink cartridges for our printer then back home to take it easy. Suzie she no wanna go= hates shopping. Now just enjoying this great weather , a bit cooler though only 75f we not used to this. But did get some quality reading time done outside between a few walkabouts here and there, yep all is good. Thought about a swim but not real sunny so passed for today. Then late afternoon gonna whip up supper. Grill a half chicken we picked up last week , easy scalloped potatoes on the Weber Q 100, the potato recipe is is HERE. Or click on my recipe Blog top right side bar. for the last couple minutes and we had a great meal. Just enjoying this great weather before we begin the long trek back to Ontario. We take it easy when we can. Thanks for enjoying our travels with us , we are having a ball! We can relax a bit on friday, right? "The Last Hurrah" Palm Springs Follies..
Met two more Bloggers today, how Awesome is that? A nice quiet day enjoying this great weather.